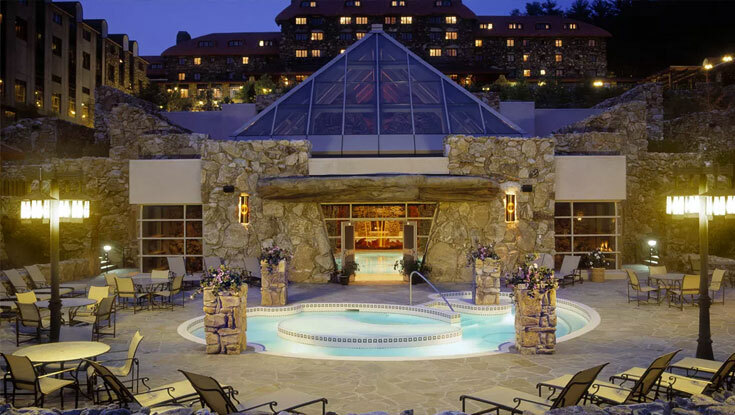 Step out of the worries of the world and in to pure relaxation at The Spa at The Omni Grove Park Inn. Twenty water features, including numerous mineral-based pools, complement the subterranean spa with cavernous rock walls, arches and tunnels. Enjoy 43,000 square feet of peace and quiet, 18,000 of which are amenities for you to enjoy before and after your treatment. Two therapeutic waterfall pools will soothe the soul and a lap pool blanketed with 6,500 fiber-optic stars and underwater music adds to the coolness of the space. Escape to the private Men’s and Women’s exhilarating contrast pools, inhalation rooms, saunas and eucalyptus-infused steam rooms. Grab a warm blanket, light snack and hot organic tea at three fireside lounges with comfortable, oversized chairs. Fireplaces, a whirlpool and tiered outdoor terrace complete the experience and helped jettison the spa into Condé Nast Traveler’s Top Resort Spas in North America. The Spa is an 18 or older facility and welcomes non-resort guests on select dates, based on availability (excluding holidays and weekends). Please call (800) 438-5800 for more information. Schedule your requested day and time with Kay Clark. Your complimentary* spa access pass is offered Thursday, Friday and Saturday based on availability. (*MHI will take care of the costs for (1) day pass each board member and spouse.) Spa treatments are not included. Click here to learn more.